At the beginning of the 2018 season, Rochester Community and Technical College head volleyball coach Amber Zitzow had lofty goals: make nationals. The team won a national championship in 2015, but hadn’t reached those heights since. This season the team was moved from eighth place to fourth in the national rankings – its highest ranking since 2014. The Yellowjackets are also 9-0 in the Minnesota College Athletic Conference. “Our goal is to win the conference undefeated,” Zitzow said. A regional tournament comes later, and winning that would send them to nationals, which is being held at RCTC. Zitzow, however, is trying to keep focused on one game at a time. One key to the great play is friendship. 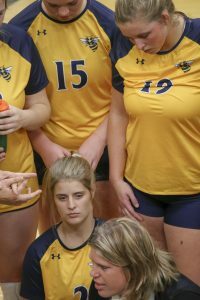 Sophomore captain and middle hitter Mariah Steinbach explained that the team met at the beginning of the season in the conference room at the RCTC Sports Center and talked about what they wanted to do as a team this season. From left: Kaelyn Marzolf and Alexis Dudycha. For Steinbach, the change from last year to this one has been huge. She said there is a lot more trust, connection, and energy. “She (Zitzow) does have a national title… so she knows exactly what she’s doing,” Steinbach explained further on how the team is progressing and thinking throughout this season. RCTC head coach Amber Zitzow gives her team instructions during a timeout. Rutledge, as a freshman, does admit it was nerve-wracking to come into a team with all new people, but was able to quickly acclimate thanks to how friendly everyone was. But what is most surprising this season is how well the team has taken to Zitzow’s strategy. “They’ve caught on to techniques and strategy and stuff like that faster than I think most of the teams that we’ve had,” Zitzow said. 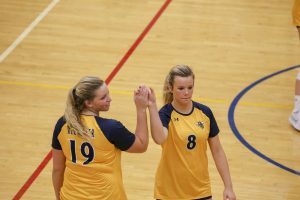 “It’s a little more surprising too because we have 10 freshmen,” RCTC assistant volleyball coach Tori Johnson added. There are only three sophomores, and often times the court is filled with freshmen. 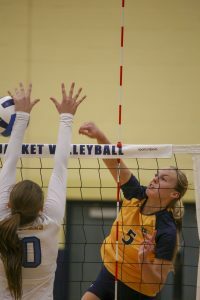 The Yellowjacket volleyball team is 17-8 on the season. One loss has come from an NJCAA Division III team, and the other seven are from division I and II teams.